This is the same game that you played way back when. You are part of a wagon train attempting to make it out west to find your fortune. 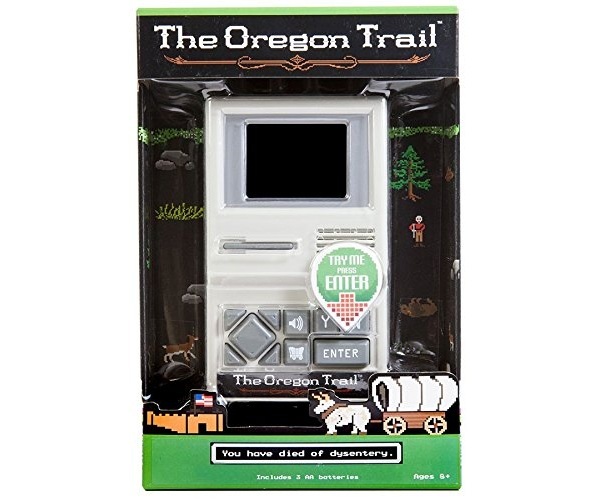 Of course, before you get there, you have to survive all manner of things, including the dreaded dysentery. Although the device looks a little like the classic GameBoy, it only plays this one game. It comes with 3 AA batteries to get you started. This is very basic game play and it won’t probably won’t take you long to beat. Or maybe it will if you’re not so lucky on the trail. You can grab this for $29.92.